Aquatic Life Color Changing Mixed Bed DI Cartridges are the most effective and easy to use DI cartridges available - filled with Resintech MBD-30 resin. 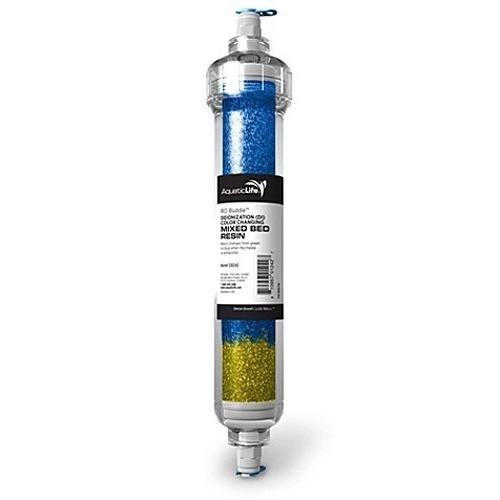 Features: Cation and Anion resins (H+ and OH-) remove the remaining total dissolved solids (TDS) from membrane-filtered water. 10" standard cartridge size includes a top gasket for a secure fit, and NEW Cartridge housing shape lends itself to efficient water-to-resin contact, and NEW Opaque cartridge takes the guess work out of determining when resin is exhausted. Resintech MBD-30 Resin changes from blue to yellow, then tan to white when depleted.